Fluffy balls – 5 in line. 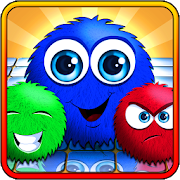 Fluffy balls it is amazing free game. The game rules are very simple. Place 5 or more balls of the same color vertically, horizontally or diagonally to score points. Watch out! Every time when you move a ball, three new balls appear! Fluffy balls is perfect game for people of any age. Inside, you will find amazing graphics and cool sounds. – 4 beautiful backgrounds: beach, desert, meadow, winter. In case of any problems with the effect of Fluffy balls, instead of giving us the negative opinion, please send us an e-mail and review briefly the problem. It will help us to solve it in the next updates of game. Fluffy balls is free but contains ads. Revenue from advertising will help us to create new attractive game, wallpapers and applications. All permissions are required only for advertising and are supported by trusted vendors.